We are looking for swimming teachers to join our team. Our swimming lessons in North Somerset are proving so popular, that we are looking for energetic, fun and enthusiastic swimming teachers to join the team. You don’t have to be an expert swimmer, but if you love swimming and feel that you could inspire children to do the same, please get in contact with Vic or myself. 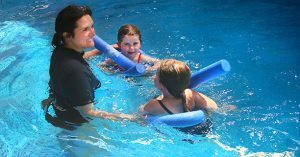 How to train as a swimming teacher / What qualifications do I require to become a swimming teacher? If you are interested in training as a swimming teacher, the first place to look for information on the training & qualifications required is the Amatuer Swimming Association (ASA) or Swimming Teachers Association (STA). Both run their own programme of training which are made up to 2 levels. The STA run courses all over the country and each course takes approximately 4-5 days to complete. Please drop us an email if you would like to join our fabulous team of teachers.